Last month as you all know was the tragic sinking of the Costa Concordia cruise ship. My mom and I had the pleasure of experiencing that beautiful ship a few years ago while traveling in the Mediterranean. I hadn’t thought much about that trip for awhile, but as soon as I heard of the tragedy those memories started to return. Then is when I was first introduced to saffron and other spices not commonly used here in the states. We visited Tunisia and the souks of the Tunis Medina where we explored the local perfumeries and spice markets. 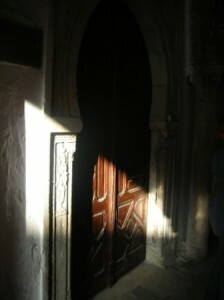 I have lots of photographs of our trip but could only choose one, this was one of my favorites. That was an experience of a lifetime and a place I would love to explore again…maybe someday. I hope that you can see it one day, too. This seasoning combination is of my own devising, but it conjures up images of Morocco, Tunisia, and Egypt in my imagination. My son, Gary, is a lover of international cuisine so this spice inspired creation was with him in mind; little did I know that Kenny would appreciate this as well. If you can get saffron, please use it. It offers a unique flavor that there’s just no substitute for. 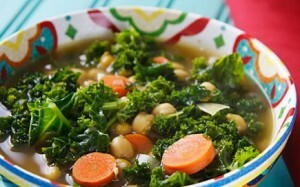 This is truly a vegetarian soup, but chicken broth could be used and would only enhance the flavor. In a large saucepan heat olive oil, add the onion and carrot and cook over medium-high heat until the onion begins to brown (about 5 minutes). Add the garlic and cook for an additional minute. Then add the spices, including bay leaves and cinnamon stick, and cook, stirring, for another minute. Add the chickpeas and stir to coat them with the spices. Pour in the 8 cups of vegetable stock, bring to a boil, and reduce heat to a simmer for 20 minutes. The word saffron is derived from the Arabic word za’faran meaning yellow. Human cultivation and use of saffron spans more than 3,500 years and spans cultures, continents, and civilizations. 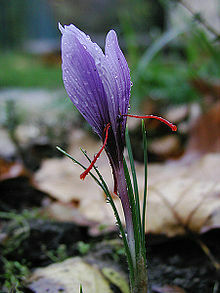 Saffron, a spice derived from the dried stigmas of the saffron crocus (Crocus sativus), there are only 3 stigmas (referred to as saffron threads) per flower. Saffron is hand harvested so you can understand why it is so prized and so expensive. It takes about 13,125 threads to weigh one ounce. So through history it remained among the world’s most costly substances. The most important rule is “don’t use too much”. A very little bit of saffron goes a long way and if overused becomes overpowering and leaves a “medicinal” flavor. When determining how much saffron to use in cooking, remember that the saffron flavor will be stronger the second day. In general, just use a pinch in soups and stews that serve 4 to 6 people. A few additional hints…if your recipe includes liquid (water, broth, or wine), use a little of it and pour over the saffron. Turmeric may be substituted for the color properties, not the flavor. Do not use wooden utensils when mixing saffron, wood utensils tend to absorb saffron easily, and since saffron is expensive, you don’t want to waste it…plus it “stains” your wood.